We spent a delightful few hours yesterday in the company of Andy Baker of Sound Design Distribution and his new range of Mola-Mola amplification. Y ou haven’t heard of Mola-Mola? You will, you will. The Dutch-based company is the brainchild of Bruno Putzeys, a long-standing luminary of pro audio, who’s now brought his Ncore technology to consumer audio. We listened to the Mola-Mola Makua linestage (photo), with integral (optional) DAC and phono stage, and a pair of Kaluga monoblocs (yeah, they’re all names of exotic fish). After a bit of fiddling with USB cables (Andy initially used one that wasn’t run in), we heard some really remarkable sounds from digital files stored on a laptop. Big soundstage, defined presence, wonderful, musical detail. We also listened briefly to the phono stage, which was very creditable, and certainly great value for money. But the DAC is definitely the star of this show. All functions of the Makua can be controlled by a tablet/mobile app. For instance, phono stage loading and gain are adjustable remotely, and you can even select equalisation for your older records. Design is very elegant and tactile, a curvy chassis finished in sanded aluminium with a discreet engraved logo. 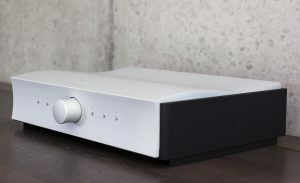 The Makua is priced at £7,300, a pair of the Kaluga monoblocs, rated at 400 Watts into 8 Ohms, are £10,000, and the optional integral DAC and phono stage are £4,300 and £1,700 respectively. Look out for Mola-Mola at the Windsor show in October. We’re hoping to entice Andy to demo the range at the 2017 Bath AudioFest. For more info, visit the Mola-Mola website.